Although publishing comic work online is possible, many people are still more interested with the classic, printed comic books. Publishing comics in print can be lucrative if your comic book sells well. When deciding to have your comic work published in print, it is important to give it your best shot so that it generates high sales and the local publishing company will ask you to produce more work for them. Before deciding to have your comic book printed for publishing, polish your work first. Make sure that the characters are drawn consistently, the spellings are correct and there are no minor mistakes. Show your work to your colleagues and ask for suggestions. It is always best to have someone else take a second look on your work. Note that when you are working on something, it is so easy to miss minor details that only other people may be able to notice. Remember that you need to get noticed for comic publishing and not for these mistakes. 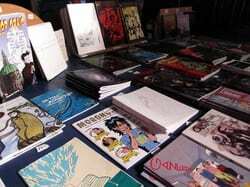 Have your comic books printed and then bring them to a book convention. Contact a publicist who can help you promote your comic book. Find a distributor to distribute them for you. When publishing comics, choosing a distributor may make or break your sales, so you have to choose one that has a reputable name in the market. If you do not have the money to start publishing comics on your own, you can submit your work to a local comic book publisher and have them reviewed. If your work conforms to their standards, you may be asked to work with an editor and polish it further. When everything is settled, they will take care of the printing and selling of your comic book. You will then get paid according to the number of books sold. Physical copy of the book. Can be kept as collection set or given as gift. More value and might fetch a better price in the future, especially if it is a limited edition or a rare issue. Can be personalized and bought to signing session of the comic artist for signature exclusive. Paper or material quality may vary. Cost more to produce on mass. If not advertised online or made digital or known, audience depends on local area/bookstore/ convention or postal service route. The three most common methods of having you comics publish in prints are Printing on Demand (PoD), Digital Printing and Offset Printing.Here we will only go through the option and what the benefits and drawbacks are but not cost of the process or product (the book). Printing on demand is a printing service which uses digital printing that prints your comic book when there is a need or a demand for it, hence the name.The score to this method of printing is that while you do not need to have a big startup money to begin with, you can print small number of your comic book for example one or two and have it sent (depends on the printing company) to you or someone else that you know.This also means that you need little to no storage space to keep your books because your comic book only prints when the is a demand or order from you. This is a good printing approach if you are publishing your book in a small scale.For example, you can have the printing company print just a couple or several of your comic book so that you can sent it to a reviewer or have them print around 30 prints so that you can sell them at comic convention or a book event. Naturally when you have your comics printed, you are going to make money from it by selling them.The downside to this is that if you are looking to sell your comics at the bookstore or wholesale, you are not going to make very little or no money at all.This is because the cost to print per book will usually cost as much as the retail price. What?….Confused? We will cover more on this in the section – Reputation, Marketing and Comic Sales. Digital printing is pretty much the same as PoD but prints on a higher volume.Digital printing prints from 100 to 1000 (maybe even 1500).The drawback is pretty much the same because it goes through the same printing process but only prints in greater number than PoD. Offset printing is a printing method that is more practical if used to print in bulks. Offset printing uses process color separation method which utilizes color with plates and rubber covering or blanket to transfer the color inks to the images on the surface material. Process color separation separates the color into four basic ink colors: cyan, magenta, yellow and black (CMYK- with K being the last letter of blacK…..we do not know how it ends up that way.) Each single colors layer will be printed step-by-step with one color on top of the other to create variations of colors from the basic inks. There are also spot colors separation, which separates colors that cannot or should not be mixed together. Spot colors are usually colors that has its own custom ink mix and is used on something specific like highlighting text or coloring the details. Because the process only uses around four basic process inks mixed within the printing process which is far less expensive when compared to individual spot/custom inks, this definitely the more cost effective and efficient way to print but work involved in the set-up of the printing process means that it is more practical print in bulks or in the thousands. Offset printing is only available for prints above 1000 copies.This printing method is by far the most practical if you are looking to print your comic book in large number and sell them in larger scale like for example, wholesale or sell them to bookstores. Because this process uses plates, the process of creating the plates can be costly. But once created, you can use the plate sets to generate from hundreds to thousands of copies. The cost per copy of your comic book decreases the more you print using this method.For example, you are printing around 2000 copies at the cost of (roughly – not accurate) about two dollars per copy.But if you print around 3000 copies then the price copy will be reduce to (again- not accurate) one dollar per copy.Printing with this method can be quite tricky and complicated, especially if you are looking to benefit more from it.If you decide to go through with offset printing, you should really take your time.In the process of dealing with printing company that uses this printing method, you will come across things like, quotation, asking price, and a lot more. It is advisable that you know the lingo when dealing with the printing company that you are planning to approach. The downside of offset printing is that you are ordering them in bulk, so you are going to need a nice safe place to store them and unless you are planning to store them for several years, you will need to find a good way to sell them off either through bookstores or in conventions.Depending on the volume of your order, it might take some time to sell them before you can actual count the full profit.Add to that the cost of printing and other details like paper characteristics, covers and bleed..etc, that if not clarified, can cost you quite an amount of money.Most printing companies that does offset printing does not do less than a thousand copies per order, you you could try out your luck and ask them if they could print for less than a thousand copies (Maybe they do, maybe the don’t). But if you have everything planned out and have ways to sell them to bookstores or events, offset printing is by far a cost effective way for high volume printing. You should also ask anyone who has published a book or comic book and they will most likely share their experience in dealing with printers before.If you could not find anyone in your local area who knows who knows much about offset printing, look it up on the internet. There are dozens of art or comic forums online with people who might be in your area and can give you advise on how to make the best out of offset printing. The most important thing to avoid when publishing comics is copyright infringement, which can cost you thousands of dollars if someone sues you for it. Make sure that your work is original and does not resemble similar materials that have previously been printed. Your concepts and stories should be significantly different to other existing comic strips. Another legal responsibility when publishing comics is to obtain a ‘Vendors’ Permit’ or other equivalent permits in your area if you are going to sell the comics directly to the public. You should also pay the taxes that are due to you. Ask around (especially those who have experience in comic book publishing) on how to include your earnings on your taxes and how to file a tax form. Keep all records of purchases related to your publishing work because they can serve as tax deductibles and save you tax money. Ultimately, publishing your own comic book can mean a lot of work, but all the hard work will pay off once you have established a name in the comic world. If you are self-publishing your own comic books, you have to consider the cost of production. Note that color printing will cost you a lot more than black-and-white printing, so you may want to choose the cheaper option for comic publishing. Choosing a more inexpensive quality allows you to print more copies, which means greater revenue for you. In case your comic books do not generate high revenue as you had expected, at least you did not have to shell out too much money on production. Advertising your comic work can be difficult, not to mention expensive. In fact, the cost of advertising in comic publishing can be higher than the cost of production. It can cost you thousands of dollars, depending on the venue you choose to advertise in. You may want to advertise in one of the most popular comic-related books or magazines to be able to reach your target market. The cost of advertising also depends on how many times your ad will appear on the magazine and the size of the advertisement – whether it’s going to cover a whole page, or whether it will come in color or black-and-white. The cost effective way of advertising your comic in to go online and advertise there. Advertising online can give you more versatility when doing advertisement and several different advertising format/method and approach for you to choose from. To learn more about advertising online, click Reputation, Marketing and Comic Sales. 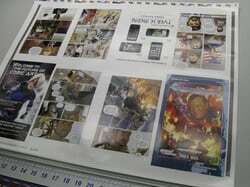 Publish digital copies or physical prints? Offline or online?….why not both! Once you have a significant number of followers or fans (this could take time to build up) and you know that they are looking forward to something new from you , then you can start the process of publishing your own comic print.You should also be transparent about it. Make the announcement, tell them what you are going to publish and when (give them a date), make your followers and fans excited when they hear about it. Now, as to having your comic books published in prints or digital, it actually depends on the situation (and your target market). If you are limited in your budget, then having your comic published digitally is a good option as anyone who have access to your website or blog should be able to purchase them and read it instantly online. If there is a comic convention coming up in your area and you were able to get a booth there, then you should have your comics published in prints so that you can sell physical copies of your comic books to the people attending the convention.We have a whole section explaining more about this in the next section.If you like to know more on how to monetize your comic book, check out the next section here (Reputation, Marketing and Comic Sales).